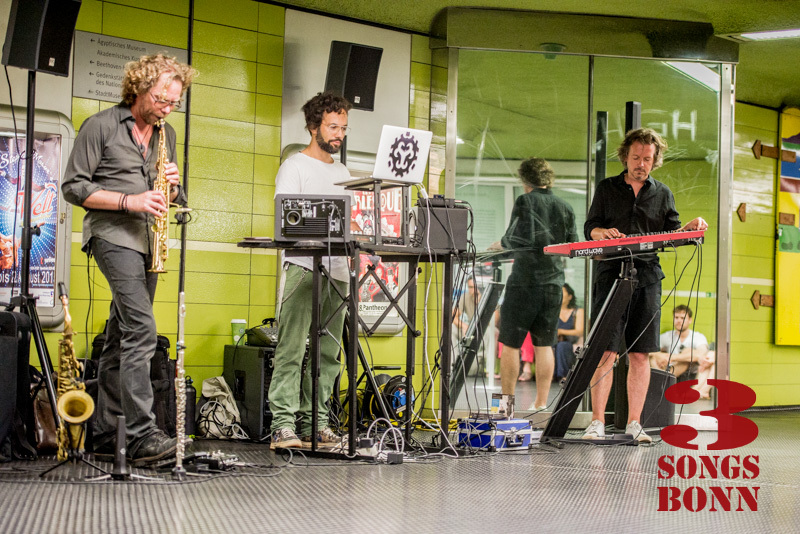 Commuters will have noticed this past weekend that rather than the unmusical whirr of automatic doors and clicking of start/stopping escalator stairways there were more musical sounds coming from the Bonn underground. JazzTube was Back! At the Hauptbahnhof, following the music would have led you to the smiling face of David Rynkowski behind his Nord Electro piano synthesizer. Sadly Aniko Kanthak had called in sick so it was left to Rynkowski’s high voice to keep the commuters entertained – with the help of an excellent backing band. Luciel was the name if you enjoyed their sets and want to vote (see link at the end of this article). Then again, if your Jazz ‘thing’ is based on the unexpected and the improvised then you would have been well served at Universität/Markt in the company of Jazz ‘n’ Lectro. The unexpected in this case included Marcus Schinkel watch his keyboard gradually tilt over and down mid-song. 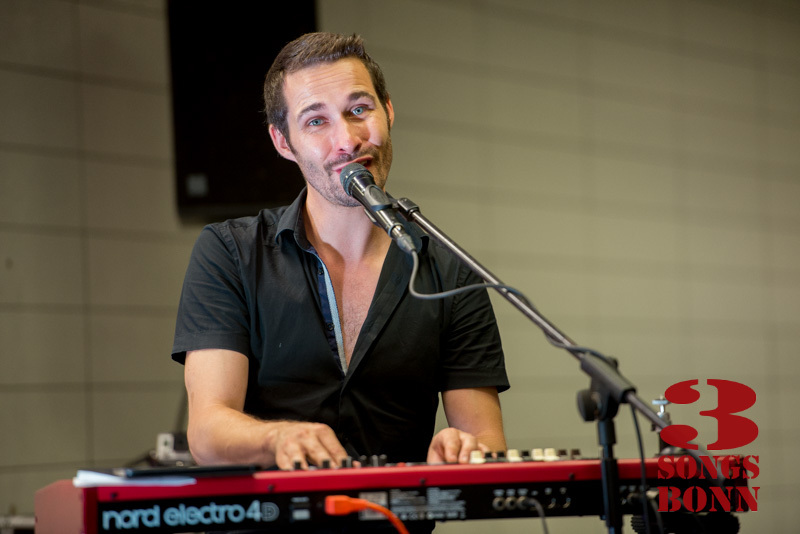 It all ended in smiles though and colleague CJ Majou (playing a Laptop, which isn’t something I expected as an instrument in a Jazzband, but hey, it’s 2015…) . Much more traditional was Reiner Witzel switching between saxophone and clarinet. A quirky combination of instruments – is this the future of Jazz I wonder? Cold computers and warm saxophones? It’s your vote people. But don’t vote yet. There’s still Heusallee/Museumsmeile and this stop is always worth a visit. 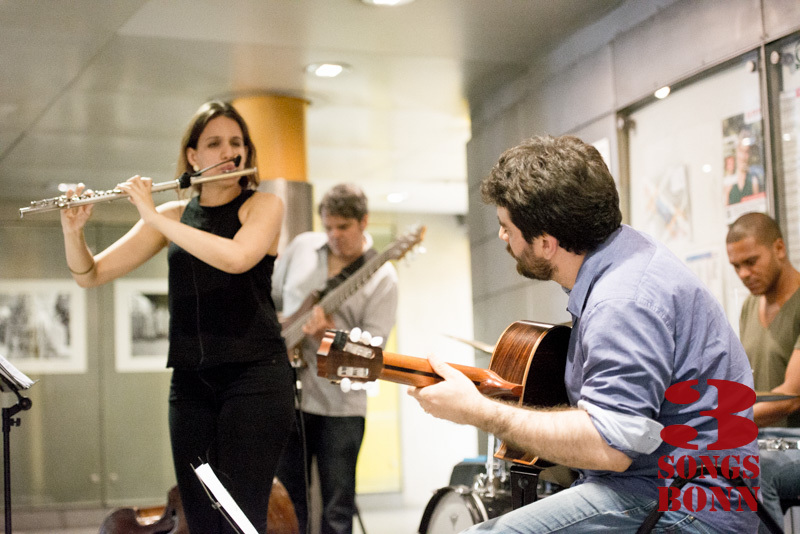 On Friday it was populated by Samba Jazz Clube with a Brazilian ensemble around Morgana Moreno on a sweet sounding cross flute. I particularly liked too the guitar playing of Joao Luis Nogueira and Andre de Cayres made a sympathetic impression introducing the numbers. Dummer Biroska da Matta aalso impressed with the varied rhythms that this talented band offered – much of the material own compositions. Certainly a lot more than ‘just’ Samba was on offer. Okay, I say it every year because every year it’s true. Can you really choose between chalk and cheese? So many different ideas of playing Jazz. But that’s really half the fun of a trip around the Underground stations on a JazzTube evening. If you had trouble choosing a favourite on Friday you could have seen two more bands playing on Saturday. I missed them this time around but I’m sure it would just have made choosing a favourite even more difficult. This entry was posted in Gig Reviews, News and tagged JazzTube Bonn. Bookmark the permalink.